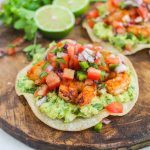 Shrimp marinated in spices and grilled until golden brown top these easy weeknight shrimp tostadas. Don’t forget the guacamole and pico de gallo! Today we’re taking a break from our Tour of Italy for a quick detour to Mexico! As some of you may know, I’ve been creating recipes for a meal planning app called Mealime. It’s a really neat app that lets you build a meal plan from their hundreds of recipes, and then it creates a grocery list for you! It even connects with Instacart so you can get everything delivered. So easy! Most of the recipes are pretty well balanced nutritionally, too. You can even personalize the app by selecting your preferences, like “no seafood” or “no tofu” and it’ll hide recipes with those items. There’s vegetarian, vegan, and gluten free options too! Go check it out! 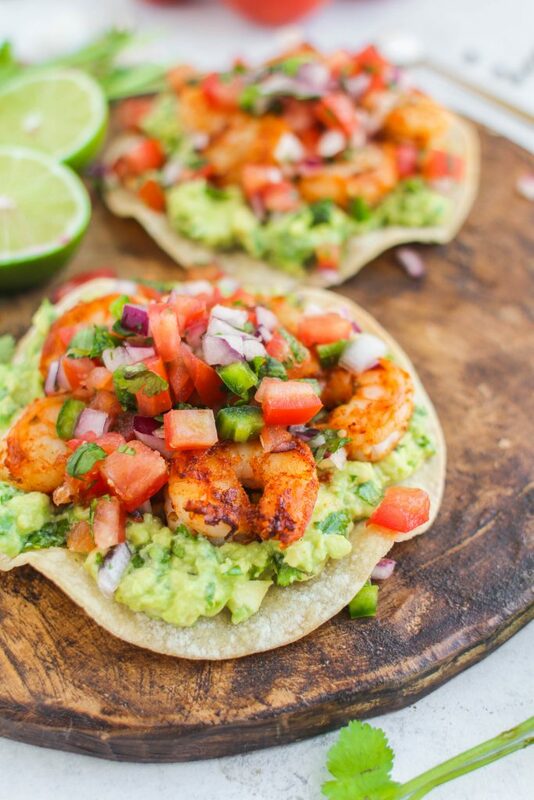 I created this shrimp tostada recipe that will be published in the next week or so in the app. It’s a really easy weeknight recipe that comes together in less than 30 minutes! You’ll make your own guacamole and pico de gallo (or feel free to cheat and buy these pre-made at the grocery store). The shrimp are tossed in a delicious spice mixture — cumin, chili pepper, garlic, oregano, onion, salt and pepper. If you don’t already have a grill pan, I would highly recommend that you purchase one. I have the Calphalon grill pan and it’s amazing. Paired with my new gas stove, this pan creates beautiful char lines. It also heats up quickly and distributes heat very well. 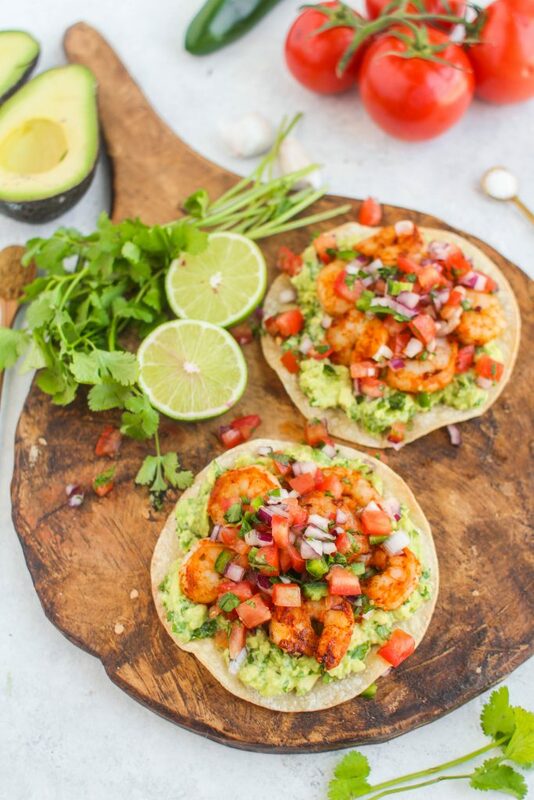 I hope you try this simple and delicious shrimp tostadas recipe! With the heat of summer coming up here in Texas, it’s the perfect light and refreshing dinner full of summer produce. In a medium bowl, combine the chili powder, cumin, oregano, garlic powder, onion powder, salt, pepper and olive oil. Toss shrimp in spice mixture and set aside. Combine the avocados, cilantro, garlic, lime juice, salt and pepper for the guacamole in a medium bowl and set aside. Combine the tomatoes, garlic, jalapeno, red onion and cilantro for the pico de gallo in a medium bowl and set aside. Preheat a grill pan or skillet over medium heat. Spray with cooking spray. Add the shrimp to the grill pan; cook until opaque, 1-2 minutes per side. 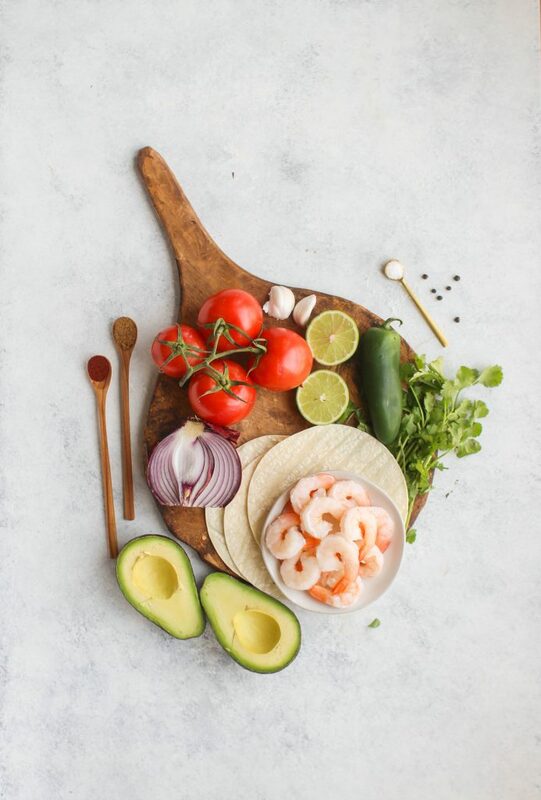 To serve, divide the tostada shells between plates, top with guacamole, shrimp, and pico de gallo.